FukushimaVoice: Position Statement: What Is Currently Happening to Fukushima Children? Consideration of thyroid disorders, pulmonary function, bone marrow function based on the studies from the Chernobyl nuclear accident, etc. (1) Thyroid cysts found in 35% of Fukushima children examined with an average age of 10. 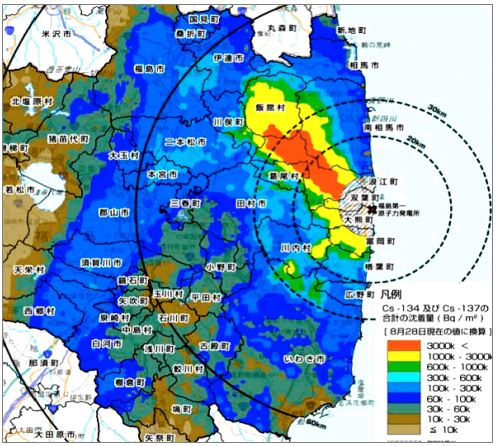 Thyroid examinations of Fukushima children have been implemented as part of the “Fukushima Prefecture Health Management Survey” to monitor the health effects of the Fukushima Daiichi Nuclear Power Plant nuclear accident. The results of the thyroid examinations released on April 26, 2012 are summarized here. The implementation status of the examinations and the summary of the results are shown in the above document, the sixth report of Fukushima Prefecture Health Management Survey. Age distribution of the children who received thyroid examinations (average age of 10 in 4th or 5th grades), follow. Actual examination findings are evidenced in the chart below. “Nodules” comprised 1% and “cysts” 35.1%. In regards to Fukushima thyroid examinations including children from babies and infants up to high school students, I would like to discuss the prevalence of “cysts” detected by thyroid ultrasound examinations in comparison to the research result reported in the past. (2) In 250 children ages 7 to 14, two children (0.8%) had thyroid cysts. Prevalence of Palpable Thyroid Nodules Detected at Autopsy or by Ultrasound (●) or by Palpation (□) in Subjects without Radiation Exposure or Known Thyroid Disease. The above graph indicates that the prevalence of thyroid nodules in children around the age of ten is about 1-2%. Since 25-35% of them turned out to be cysts, the prevalence of thyroid cysts is estimated to be about 0.5-1%. (4) Prevalence of thyroid cysts in Chernobyl children under the age of 18 was 0.5%. From 5 to 10 years after the Chernobyl accident, Shunichi Yamashita, the vice president of Fukushima University Medical School, conducted ultrasound thyroid examinations in a total of 160,000 children in Gomel and surrounding areas with marked radioactive contamination. In this study, “nodules” and “cysts” were recorded separately: “nodules” mean solid tumors. The results show that cysts were seen in 0.5% and also “nodules (solid tumors)” were seen in 0.5%. Below is Figure 11 from this study, seen in above URL. Figure 11. 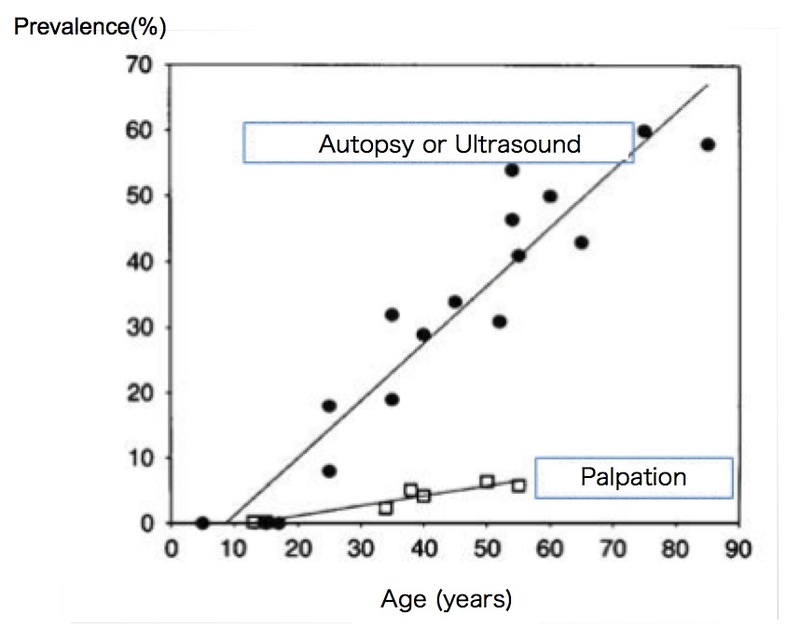 Dynamics of prevalence of abnormal findings by thyroid ultrasound examinations (1991-1996). (5) Prevalence of thyroid “cysts” in Fukushima children is higher than in any other studies. Summarizing the thyroid ultrasound examination results from Japan and overseas, prevalence of “cysts” detected in children around the age of 10 is approximately 0.5-1.0%. The fact that 35% of Fukushima children (average age around 10) have thyroid cysts strongly suggests that these children’s thyroid glands are negatively affected by undesirable environmental factors. There is a strong concern that waiting for further analysis of above data and the completion of follow-up examinations will lead to irreversible health damages in these children. Consequently, it is strongly desired that small children living in Nakadori (adjacent to the coastal region) and Hamadori (the coastal region) in Fukushima receive immediate implementation of preventive measures such as evacuation and more frequent screening examinations. Based on above findings, a letter from Shunichi Yamashita to thyroid specialists all over Japan, instructing them not to offer second opinions to concerned families, can only be considered a repressive conduct: a violation of human rights for those exposed to radiation and current patients. Sevendsen et al, from the Department of Epidemiology and Biostatistics, University of South Carolina, demonstrated in 2010 that children who had been living in areas heavily contaminated with radioactive cesium have decreased pulmonary function. Svendsen et al. 137Cesium Exposure and Spirometry Measures in Ukrainian Children Affected by the Chernobyl Nuclear Incident. Environmental Health Perspectives 2010 May;118(5): 720-725. In this study, pulmonary function of 415 children under the age of 18 (mode age 8-9) was followed from 1993 to 1998. The result showed that children who continuously lived in areas with the highest Cs-137 soil contamination (average 355 kBq/㎡) had 4-5% less forced expiratory volume in 1 sec (FEV1) than children who continuously lived in areas with the lowest soil contamination (average 90 kBq/㎡). Forced expiratory volume per 1 sec (FEV1) is the portion of the forced vital capacity exhaled in the first second of forced exhalation. Elementary school children can normally exhale over 3 liters in the first second of forced exhalation. A decrease of 4-5 % FEV1 means a decrease of 100 -150 cc of absolute volume of exhaled air. Normally pulmonary function peaks around age 20, and from then on, FEV1 decreases by 20-30 cc per year. A decrease of FEV1 by 150cc means either an early aging of lungs or a failure of pulmonary maturity by 5-7 years. Children who continuously live in areas of Ukraine with 355 kBq/㎡ soil contamination will have pulmonary function aging five years faster than those living in uncontaminated areas. Currently in Fukushima, which areas have Cs-137 levels of 355 kBq/㎡ vs. 90 kBq/㎡? This is a soil contamination distribution map created by the Ministry of Education, Culture, Sports, Science and Technology last year and depicts the total soil concentration of Cs-134 and Cs-137(Bq/m2) calculated to the value estimated for August 28, 2011. Deep blue ■ indicates a soil contamination level of 60-100 kBq/㎡, framing the hillsides of Nakadori: this is comparable to the “low contamination area” in the Sevedsen study. Therefore, children currently living in Hamadori (coastal region) and Nakadori (adjacent to the coastal region) are at risk of accelerated pulmonary aging by several years. Furthermore, this study underestimates the effect of radiation exposure by using the control group in low contamination areas in comparison. We must therefore be prepared to face much greater health damage in reality. The next study to be presented exhibits data about hematopoietic dysfunction due to radiation exposure in children who kept living in highly contaminated areas leading to leukopenia and anemia. This is a 2008 study published in Environmental Health by Dr. Stepanova from Scientific Center for Radiation Medicine, Academy of Medical Sciences of Ukraine. It’s a follow-up study of blood counts in 1,251 children living in Narodichesky region, Zhitomir Oblast, Ukraine from 7 to 11 years after the accident. Stepanova et al. 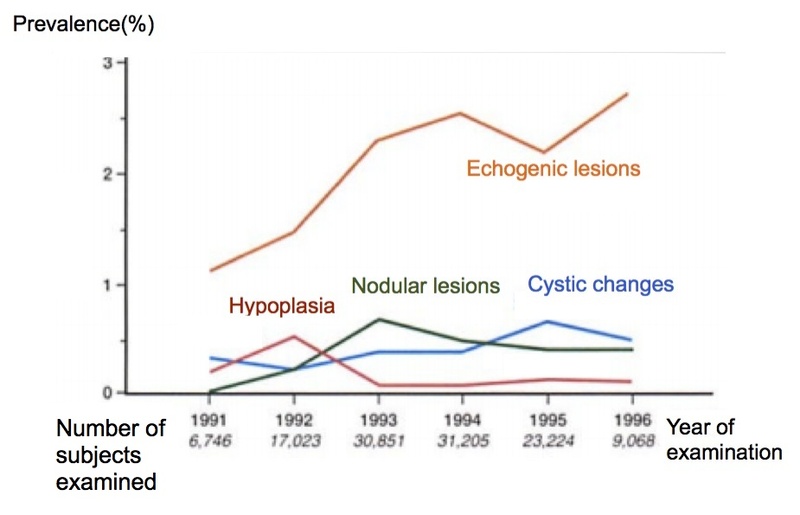 Exposure from the Chernobyl accident had adverse effects on erythrocytes, leukocytes, and, platelets in children in the Narodichesky region, Ukraine: A 6-year follow-up study. Environ Health. 2008; 7: 21-. The study revealed that children living in high contamination areas (350-879 kBq/㎡) had a 20% less leukocyte count (5,810 vs. 6,870) than those living in low contamination areas (29-112 kBq/㎡). Platelet count and erythrocyte count were also less by 5-10%. Currently in Fukushima, areas around Nakadori indicated in deep blue ■ in the previous map is similar to low contamination areas and Kawamata-machi (outside edge of Iitate-mura) area in green ■ is similar to high contamination areas. Therefore, what we need to medically assume from this study is that there is a possibility that hematopoietic function of the bone marrow might be suppressed for a long time in children who are currently living in Hamadori and Nakadori of Fukushima. Leukopenia reduces body’s resistance against bacteria and viruses. Low red blood cell count can cause anemia more easily. Low platelet count interferes with blood coagulation when hemorrhaging from injuries. Moreover, we must take into consideration that, if there are any children with illnesses or disabilities currently living in Fukushima Nakadori and Hamadori, this degree of effect on bone marrow function might exacerbate their existing conditions. Fukushima Nakadori area continues to have radiation contamination comparable to highly contaminated areas in Chernobyl. Chernobyl epidemiological studies indicated that children who keep living in such areas have serious abnormalities in pulmonary function and bone marrow function. It is clear that an immediate evacuation from highly contaminated areas is imperative in order to prevent a possibility of irreversible health damages in children with future potential for life and improved health. This is the lesson we must all learn from the tragedy of Chernobyl. This survey results makes many people to be aware of currently what is happening to fukushima children. Pay intention to the number in the title of both reports. The last report is "6" not "5". Best wishes and be precised! This article has been translated from the original Japanese paper found here: http://1am.sakura.ne.jp/Nuclear/kou131Matsuzaki-opinion.pdf. Apparently the original paper contained the wrong link. We have substituted it with the correct link, as you mentioned.